Blue sodalite is one of my favorite gemstones to work with. I was drawn to its complex swirls of colour and it’s energy as soon as I saw it at my bead supplier. Row upon row of beads were strung up at my bead whole seller’s warehouse but instead of walking around and considering all the options, I just knew immediately upon seeing this I knew I wanted it – love at first sight! After learning more about sodalite, my appreciation and love for this stone has only deepened. 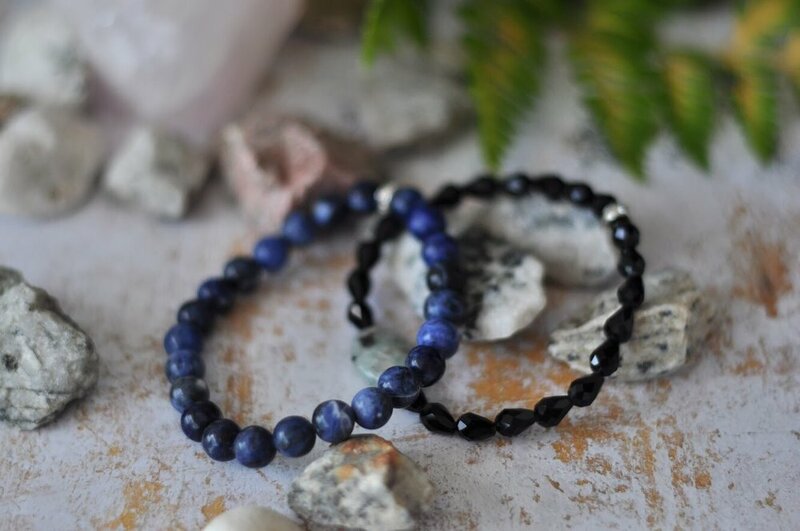 If you’re wearing one of our Aura bracelets in sodalite, I do hope you can feel the radiance of love in which it was created. Sodalite is a light but relatively hard, rock-forming mineral. It was named byGlasgow Chemist, Professor Thomas Thomson, after its high sodium content. The Greek word for salt is soda and stone is lithos. It’s high sodium content makes sodalite to be classified as a mineral, not a rock. 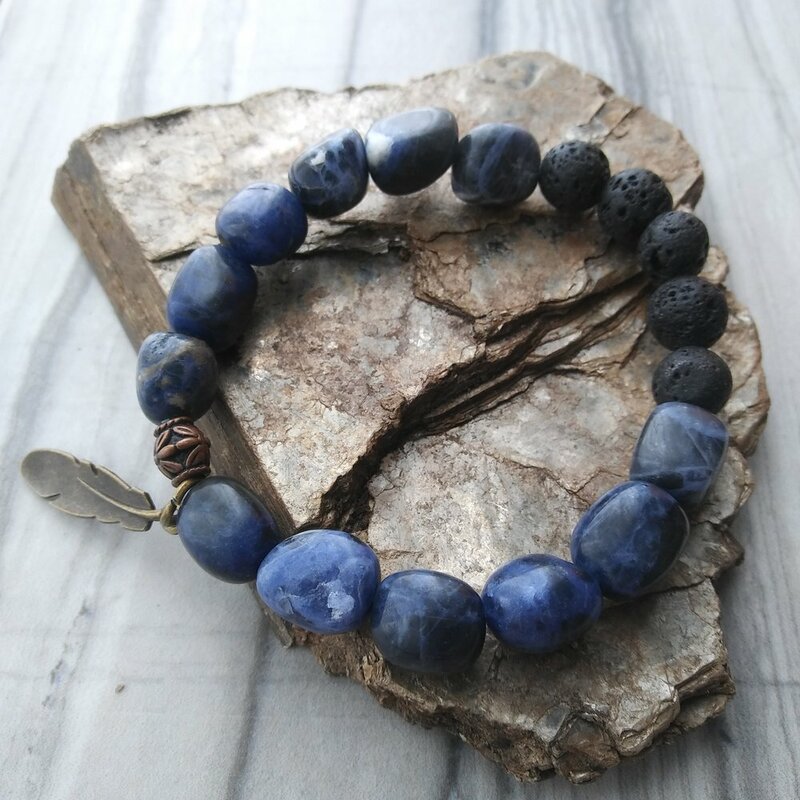 In mineralogy, sodalite is a member of the feldspathoid minerals – which is a group of rare and unusual types of igneous rocks. Igneous rock is one of three main rock types and is derived from the Latin word ignis meaning fire. Igneous rock is formed through the cooling and solidification of magma or lava. Sodalite was created with the Canadian shield (see history below!). Colours can be white, gray, purple or green but the blue variety with white marbling or veins is the most familiar; the white splotches are calcite. The general chemistry formula for the sodalite group is Na4Al3Si3O12Cl, Sodium Aluminum Silicate Chloride (geology.com). Cool geology tidbit: Most sodalite will fluoresce orange under ultraviolet light. Which basically means that soadalite emits visible light when exposed to ultraviolet light – perfect for your next rave or festival! 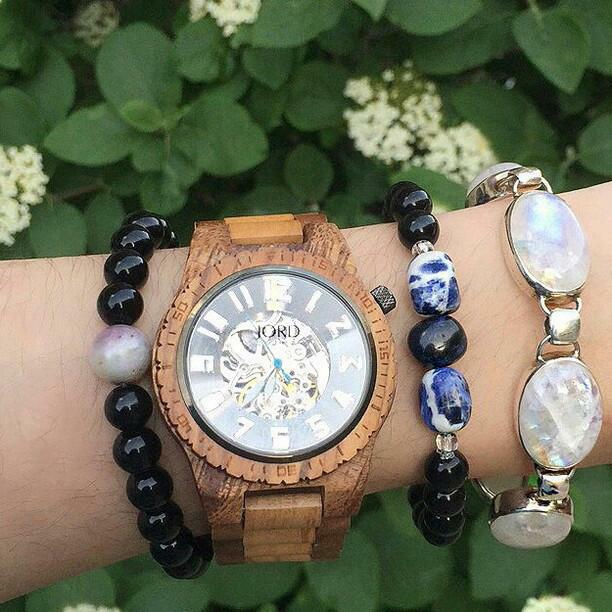 Sodalite is a rare gemstone that comes from just a handful of localities worldwide. Sodalite is quite young in gemstone years – it was discovered in 1811 in the south-west corner of Greenland. However, sodalite did not become important as an ornamental stone until 1891 when large deposits were discovered in Ontario, Canada in the Canadian Shield. One of the largest deposits of sodalite and arguably the finest is found in Brandcroft, which is half-way between Toronto and Ottawa halfway between Toronto and Ottawa and is at the southern end of Algonquin Park. The sodalite stones that Aura Stone Designs uses are sourced from Brancroft and specifically from the Princess Sodalite Mine. During her visit to the 1901 World’s Fair in Buffalo , New York , the Princess of Wales was so captivated by a gift of Bancroft sodalite that arrangements were made to quarry enough to decorate her London residence, Marlborough House. In 1906, 130 tonnes of the rock were shipped to England to be used as a decorative stone in the Princess’ royal home. And that is from where the name “Princess Sodalite Mine” comes from (more info here). It’s proprietor is Andy Christine and he offers a wealth of knowledge about the area’s mineral resources and offers collection in the ‘rock farm’ at the mine. 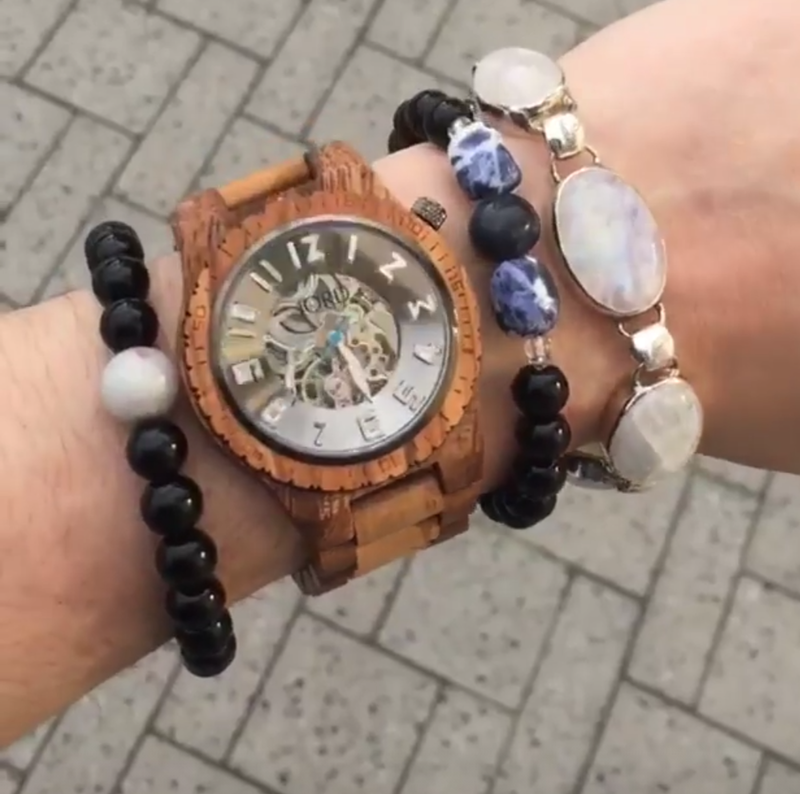 To get an even closer perspective of this beloved stone, we went to the actual Sodalite mine! The Ontario Highlights have lots of great Ontario stops for geology fans! Sodalite gemstones are known as ‘poet’s stones’ or ‘stones of truth’. It is believed that there are seven chakras in our bodies in which energy flows through. 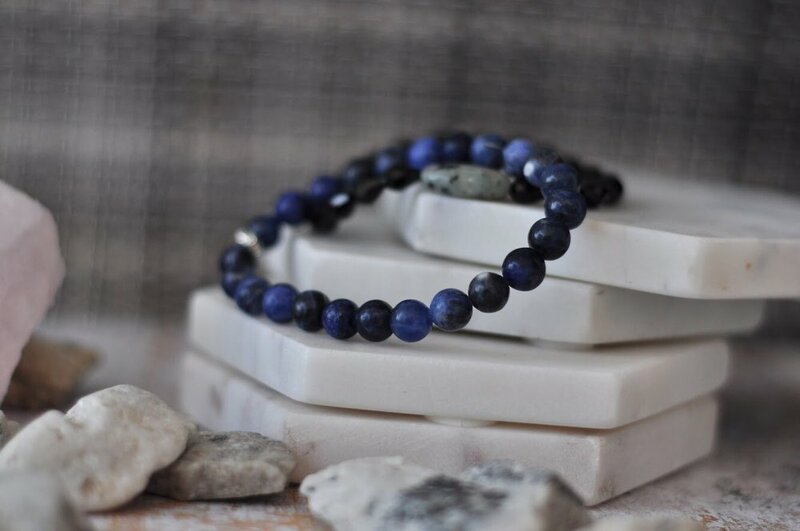 Sodalite’s primary chakra is the Throat Chakra (5th, Blue), which guides our ability to communicate and is tied to self-expression of feelings and truth and creativity. The secondary chakra is the Third Eye Chakra (6th, Indigo), which guides our ability to focus and see the big picture and is tied to intuition, imagination, wisdom, logical thinking and the ability to make decisions. I am expressing my highest potential. I am unique and celebrate my rarity. I attract positive energy only. I can visualize success and I have the patience and talent to reach it. I rise above my past; I look towards my future. I express myself with confidence and passion.